Valentine’s Day is a fun holiday for kids in the Preschool and Elementary years. Who doesn’t love getting little cards and candy? 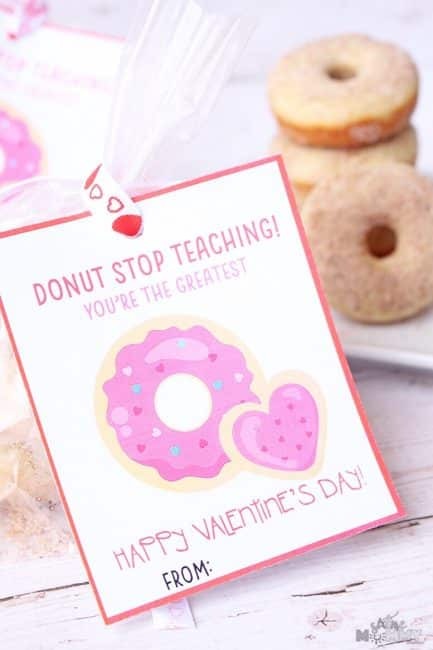 Our teacher valentine gifts are a sweet and inexpensive way to remember some awesome teachers and let them know how much they mean to us. Years ago, I designed a little card to give to the boys’ teachers on Valentine’s Day. Teacher valentine gifts don’t need to be extravagant. But they do so much for our kiddos, I want to be a little bit thoughtful. 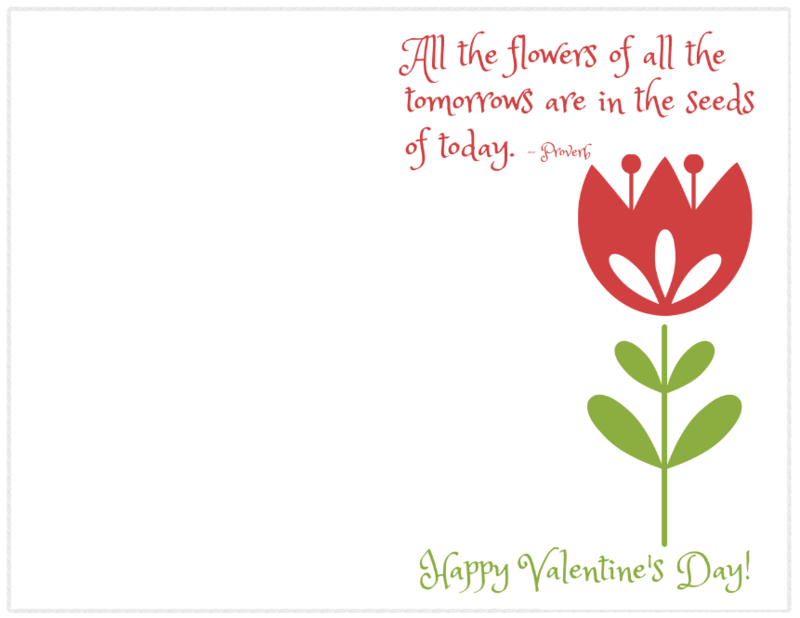 I love how our easy teacher valentine cards are simple and personal. When you print the card, the petals are missing for the flower. 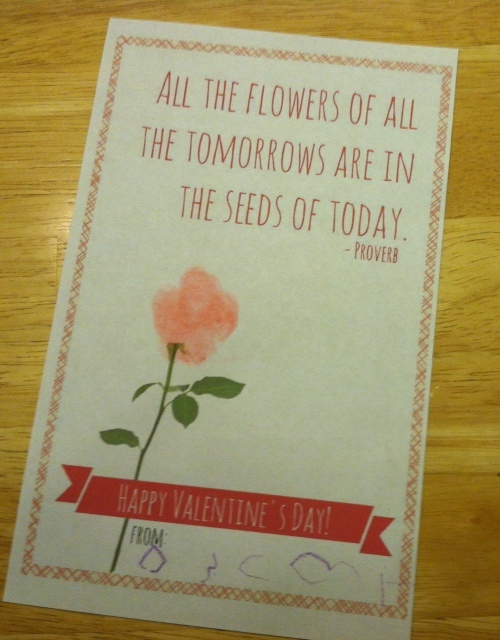 This way your child can add his or her special touch to the card. We have used used pink ink and fingerprints to make the flower and other times created a drawing. 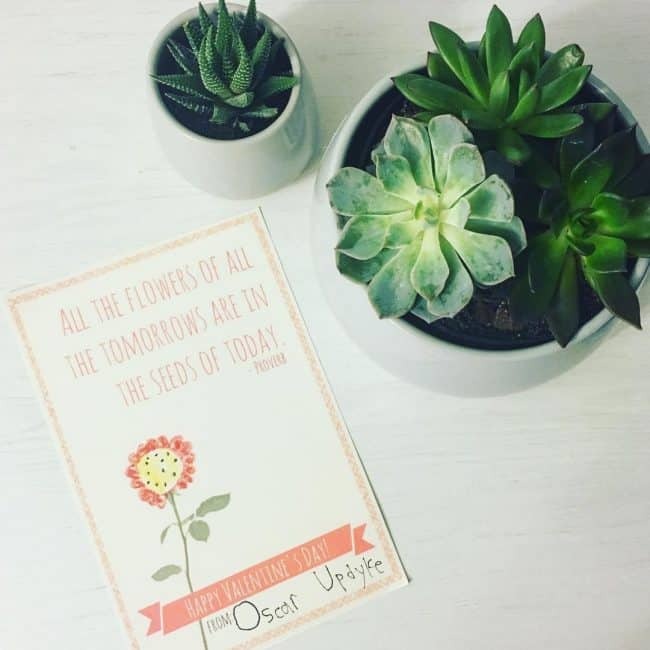 If you want to add a small gift, attach a little pack of seeds or a small plant to go along with it. I think it would be appreciated either way. My affiliate links are below, which means I may earn money from purchases made through my links at no extra cost to you. Post updated from February 2013. I made our teacher valentine card as a printable to share, so feel free to download it for your own personal use! I intentionally left off the word teacher so these really could be used for anyone. 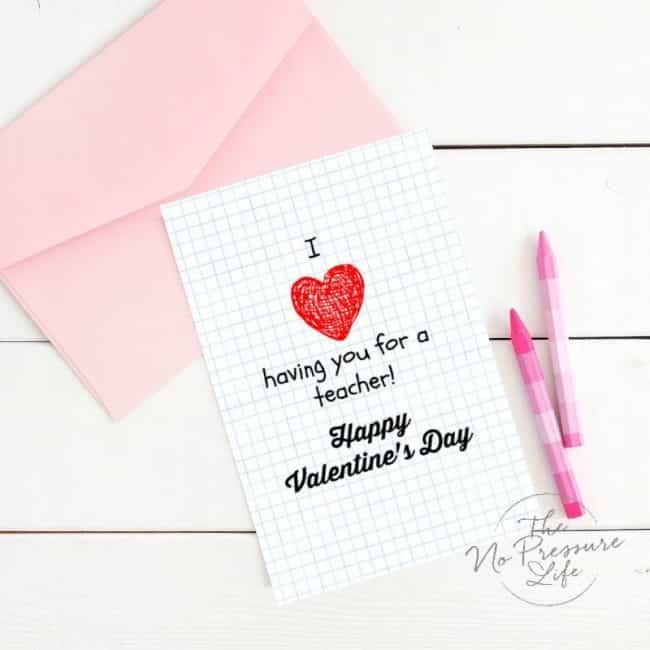 The teacher valentines print two to a page and I suggest using white card stock for the best results. (click the image or the link to print). If you don’t have time to add the fingerprint flower petals, I also created a foldable card without that added step. Just click the image and print on cardstock! 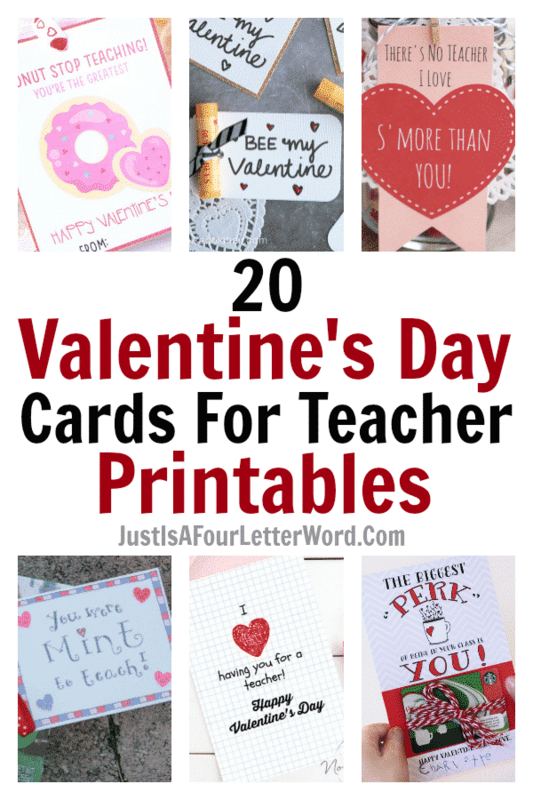 It doesn’t take much to make someone smile and I am loving all of these ideas for teacher valentine gifts! 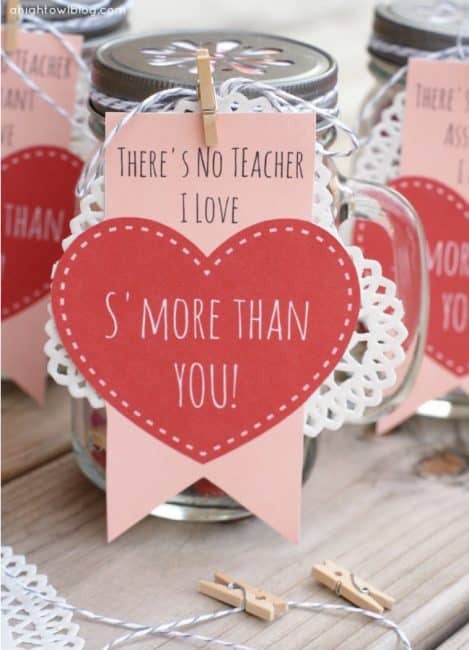 Each of these teacher valentines is free to print and they are all adorable, with or without an added gift! This I Love Having You As A Teacher Printable Card by The No Pressure Life is so adorable. Simple, sweet and from the heart. I Love My Teacher Because Printable by Paper Heart Family is another love-themed option. 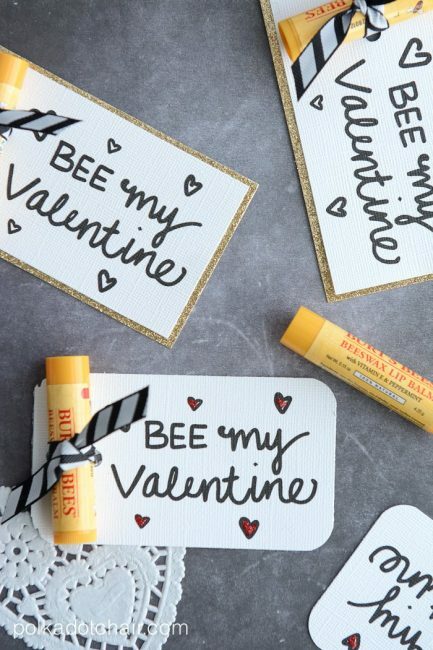 February is typically cold in most places so these lip balm themed teacher valentine gifts are cute and practical! 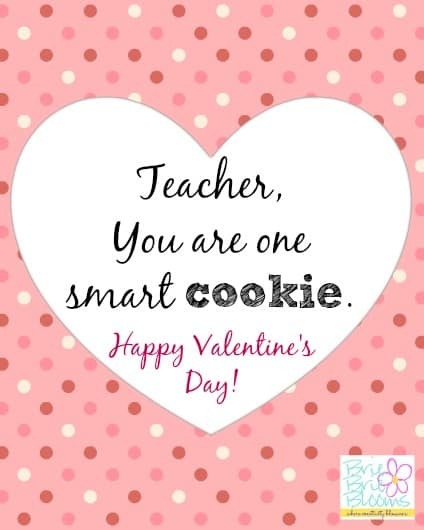 Cookies always make a fun teacher gift. 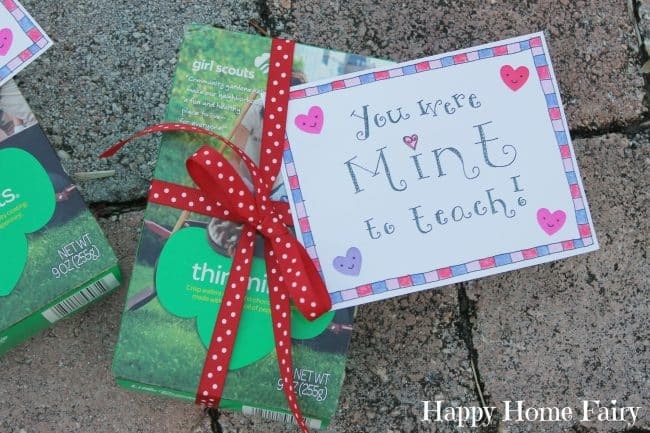 And since we happen to be in Girl Scout Season, I’m loving these You Were “Mint” To Teach Free Printable by Happy Home Fairy or another cookie-themed valentine like Teacher You Are One Smart Cookie Valentine Printable by Brie Brie Blooms. For a classic idea, these apple themed teacher valentines are super fun. These come with a twist though! Take a peek at the You Are Golden Valentine Printable by Uncommon Designs Online and An Apple For My Teacher Gift Tag Printable by Sisters Suitcase Blog. Cute mason jar gifts always steal my heart and this S’Mores Mason Jar Valentine’s Printable by A Night Owl Blog does not disappoint. Keep it simple with a traditional heart theme. Here are a few sweet valentines to choose from. Show up with a dozen donuts and this Donut Stop Teaching Gift Printable by Six Time Mommy to be a star parent! Feeling super extra? Check out these homemade donuts for Valentine’s Day recipes. Who doesn’t love coffee? Love these ideas for a coffee-loving teacher. 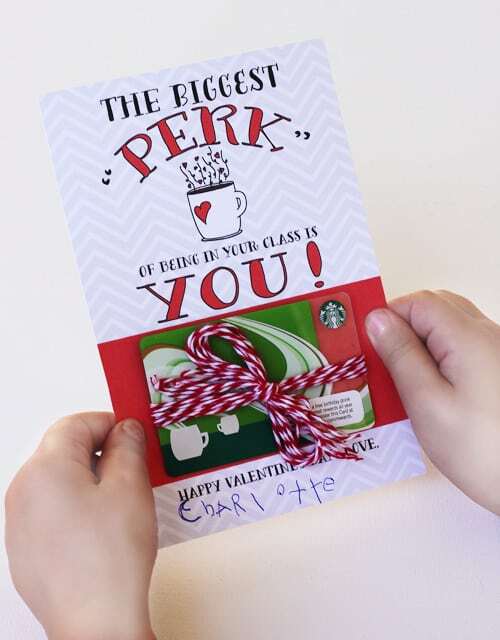 The “Biggest Perk” Valentine For Teacher by Skip To My Lou and I Like You A Latte Valentine Gift Card Printable by Busy Mom’s Helper are great options. 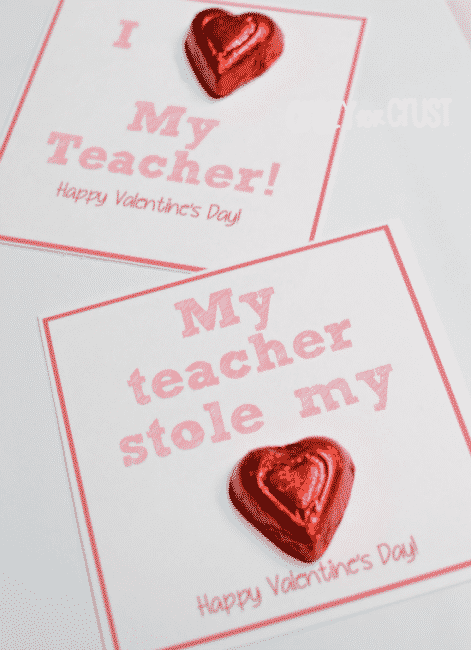 Have another idea for your valentine teacher gifts and just need a gift tag? We have those too! Check out these cute ideas. Maybe you want to give a gift card to a bookstore to catch up on his/her 2019 reading list. Or maybe a bucket of school supplies. Pop one of these tags on and you’re done. Making a teacher smile really doesn’t take much. On a holiday like Valentine’s Day, you definitely don’t need to go overboard so have fun with it! 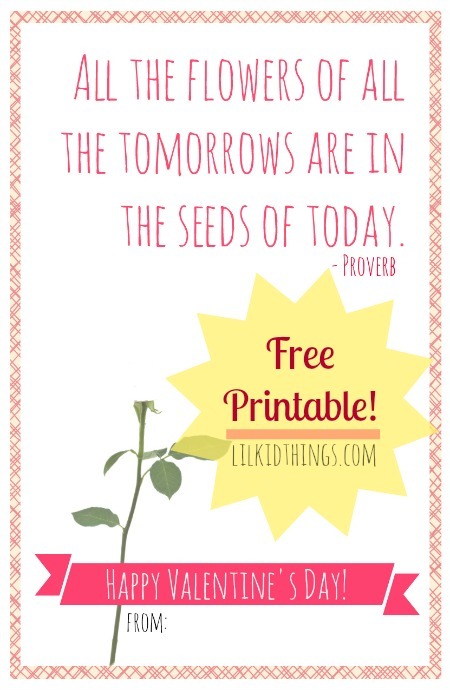 This is such a lovely printable for teachers!! This is such a cute idea!! Love that font, too. Do you mind sharing what it is? I love it too! I used picmonkey and the font is called Amatic Small Caps. Too cute for words! I wish my daughters were young enough for these kind of crafts. Love this Andrea!!! Will be printing one for each of my kids teachers. Yay! I would love to see how they turn out. You’re welcome! Hope you had a great Valentine’s Day. Thanks so much. And likewise!